With the dawning of the twentieth century, a long forgotten culture was rediscovered in the Anatolian Highlands of Asia Minor. This ancient civilization of Urartu centered on Lake Van and flourished from the 9th to the 6th century B.C. Extending from Lake Urmia in the east to North Syria in the west, the Urartian Empire was a formidable power during its three hundred year existence. Later, it was vanquished and disappeared from the memory of man. Guests are welcomed by a Peten tour manager at the Atatürk Airport where they will be transferred to their hotel. That evening will be spent meeting your fellow travellers along with your guides while enjoying a drink and sit down dinner. After breakfast we take the morning flight to Erzincan, a city embraced by mountains. We check into our hotel and get ready to explore the natural beauty and historic sights of this forgotten city. A short drive takes us to an important ancient Urartian site, Altıntepe (‘Golden Hill’), where the remains are sited on a 60-meter high volcanic hill. We will be met by the excavation team where we will see such sites as the oldest toilet, bath, sink and a Roman building with floor mosaics. In addition we will see unusual chamber-like graves built for the kings. Some artifacts are taken to a depot where we are permitted to have a look at these recent discoveries. Winding through the mountains and vineyards in this fertile and intensively cultivated countryside, we stop at Kemah to have a look at the ruined Byzantine fortress, the 13C türbe of Sultan Melik. Next we arrive at Kemaliye, a small but fascinating town on the river banks with 200-300 year old houses known for their distinct door knobs and locks. Let’s start our stroll around these well-preserved and attractive historic houses surrounded by the Euphrates. It is here we realize how apt Kemaliye’s Armenian name “Eğin” is, as it means ‘paradise’. This area attracts many visitors wanting to explore nature, culture, its delicious cuisine, along with the historical mulberry, walnut and “çinar” trees. 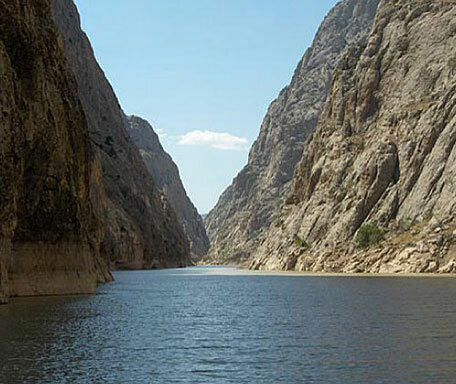 Next we take a boat trip to see the Karanlık Canyon; we are amazed at how small we are among the giant rocks that rise on both sides blotting out even the sun! A macadam road runs along a steep slope overlooking the canyon. This road, built through tunnels, offers a good alternative for those wishing to view the canyon from a different angle. 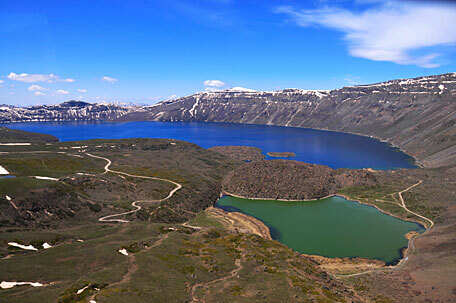 This morning finds us on the scenic road to Ağın where we take the ferry to cross the Keban Dam reservoir to Elazığ. From there it is just a short drive to Harput that today is characterized by a multicultural identity forged mainly from the Anatolian Seljuk and Ottoman traditions. The missionary American College opened in 1852 showing that Harput was a major center of culture and education in that period. 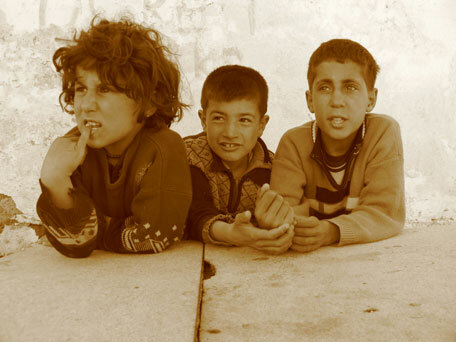 Receiving its fair share of the misty-eyed western paeans that define the East, Harput is known to the Americans as ‘the natural garden of Asia’. 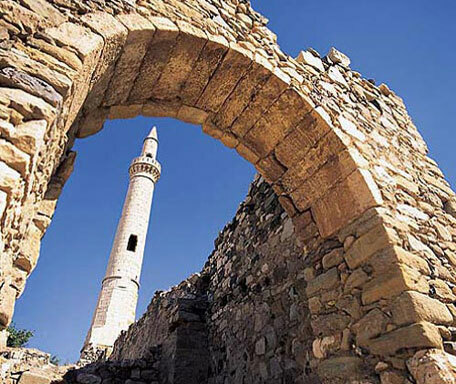 With the many monuments encountered at every step, from a castle left from the Urartu's and a Syriac Christian Church, to mosques, a madrasa, a bath, old houses, gravestones and tombs with conical roofs, Harput is a city that more than deserves the epithet 'open-air museum'. Today we shall throw ourselves into the wilderness in order to trek on the oldest Urartu highway, passing along the high meadows of the Upper Euphrates and stopping at the glacial lakes in the mountains. We will also meet with the Beritan nomads, the largest Kurdish tribe who still use these Urartu roads up into the mountains! After enjoying our breakfast we depart for Güroymak to drive to one of the natural wonders of Turkey, the volcanic Mount Nemrud. Here is where the biggest Crater Lake was formed as a result of the eruption in the fourth geological era. The mountain was named after the Babylon King Nemrut, who lived in 2100 BC. There are hot and cold water crater lakes on top of the mountain. 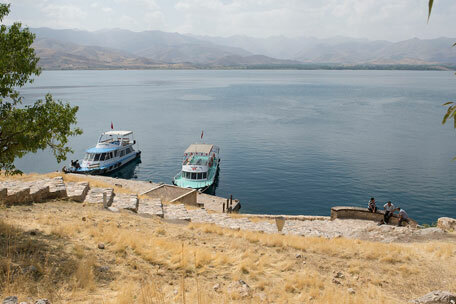 One of the most memorable experiences of our journey will be covering almost the total distance of the huge Lake Van by our vehicle.Along the way we stop at Ahlat to visit its kümbet which are unique tombs set in a Seljuk graveyard. These tombs are conical shaped mausoleums believed to echo the tents used by the nomads of Central Asia. Ahlat possesses a dozen of these striking tombs, all from the pre-Ottoman period. 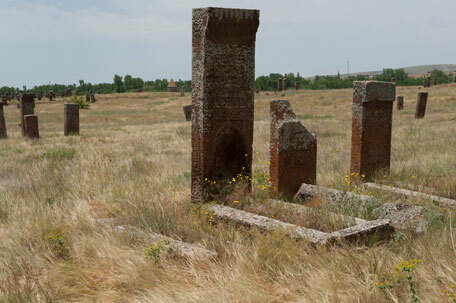 We walk to the large Seljuk cemetery, used by long-forgotten nobles and their families. 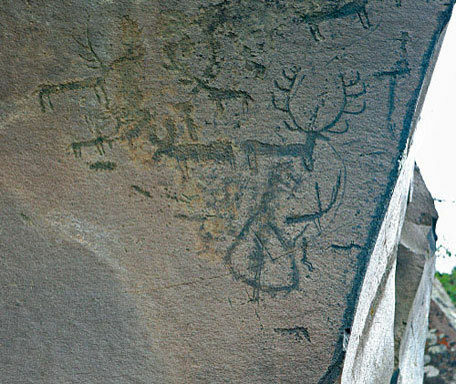 Inscriptions in Arabic, Greek and Latin are intertwined with stars, plants and mythical animals. Beyond Ahlat we reach Adilcevaz, with its attractive, chocolate-colored mosque on the shore. On the final stretch of the circuit, look for Arin Gölü, a freshwater lake whose shores are alive with a noticeably rich bird population (don’t forget to bring your binoculars!). After our full day we settle in Van for three nights. 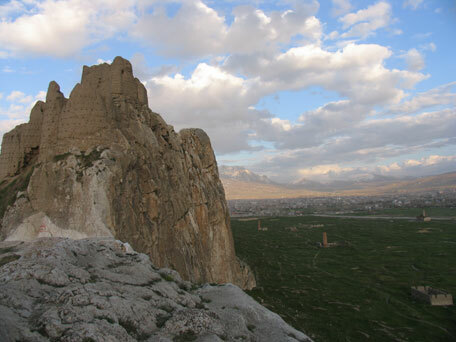 Çavuştepe, this royal Urartian citadel is the second largest after Van Kalesi. The buildings on the summit were for the royal family only, while ordinary Urartians lived on the Plain below. As well as the temple buildings, palaces, and sacrificial altar, notice the extraordinarily advanced water system, with its series of large cisterns hollowed out of the rock for collecting the rain and snow. Güzelsu (Hoşap Castle)- Like a hallucination from a fairy tale, with its crenellations and battlements, Hoşap is the best-preserved Kurdish castle in Turkey. It was built in 1643, when Ottoman power was slipping, by a local Kurdish despot. Its colossal and impressive entrance gate leads into a surprisingly open interior. Van Kalesi (Van Castle)- the settlement of Van, once called Tushpa, is hoary with age, stretching back to the days of Gilgamesh and the great flood. It was the capital of the Urartu Empire during the reign of Sarduni I (764-735 B.C) and it was he who built the long castle on the lakeshore. 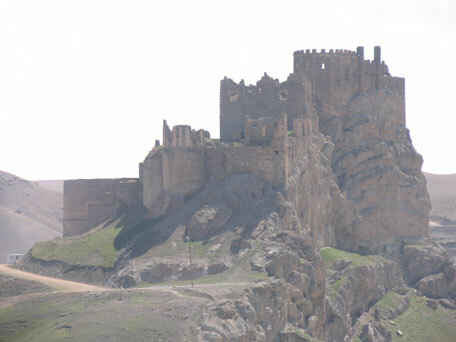 We walk in the city of Eski Van (Old Van), and then walk up to Van (Tushpa) Castle. The rock-cut steps lead to the burial chambers of King Menua and King Sarduri I. 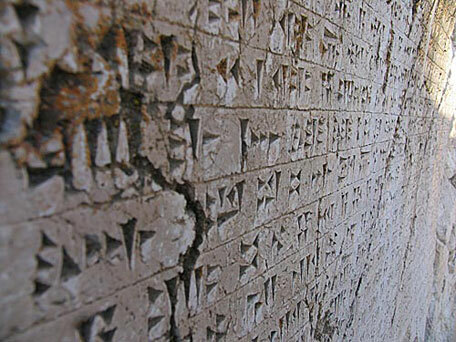 At the castle, a long, well-preserved cuneiform inscription around the entrance to the Tomb of King Argishti I records the principal events of Argishti’s reign. In the temple precinct, defenses and storerooms are the leading features of this remarkable late Urartian citadel, firmly dated by the long temple inscription and dendrochronology to the reign of Rusa II (c.685-645 BC), the great builder and reorganizer of the kingdom. The brevity of these notes will, hopefully, be explained by the excavator, Altan Cilingiroglu. The excavations began here in 1989. The walls flanking the entrance to the temple sanctuary are decorated with stone inlay (intaglio) designs. In the centre stood a podium faced in alabaster, with finely incised designs with either lion or eagle heads. Such decoration and preservation has not been found elsewhere in Urartu. In common with those in other fortresses, the storerooms contain ordered rows of large jars (pithoi), many with impressed or incised designs, cuneiform or pictographic. Ayanis has yielded an abundance and variety of pottery, from the fine red polished Urartian ware to plain wares. The masonry of the perimeter walls is of finely dressed andesite blocks, surmounted by mud brick. Below the fortress is an outer town, now extensively excavated, the first such exposure in Turkey. We end the day at Van’s museum. Here we have the opportunity to see a well-displayed collection of 7th and 8th century B.C. Urartian finds. These include fragments of murals, mosaics, gold jewelry, children’s toys, pottery vessels and bronze plaques. The Mystery Stelae from the Hakkari district are a recent discovery and they fortunately have been brought to the Van Museum. The stelae may depict the rulers of Hubushkia, a kingdom known from the Assyrian annals. (To learn more about the stelae refer to Prof.Velli Sevin’s article in the July/August 2001 issue of the American Archaeology Magazine, pp 46 - 48). Dinner is at a local restaurant. This morning we visit Carpanak Island (Gduts) from the city of Van by boat. Housing a monastery and 12th century church of St.John, the island commands spectacular views of the lake, Mt.Suphan and Van Castle. There are also ruins of a hermitage and monks’ cells. There are also well known scriptorium at the monastery from the 15th century and Gduts continued to function as a hermitage until 1915. We will have a picnic lunch on the island with the opportunity for a swim on the lake. Continue to the 9th century Church of the Holy Cross on Akdamar Island. 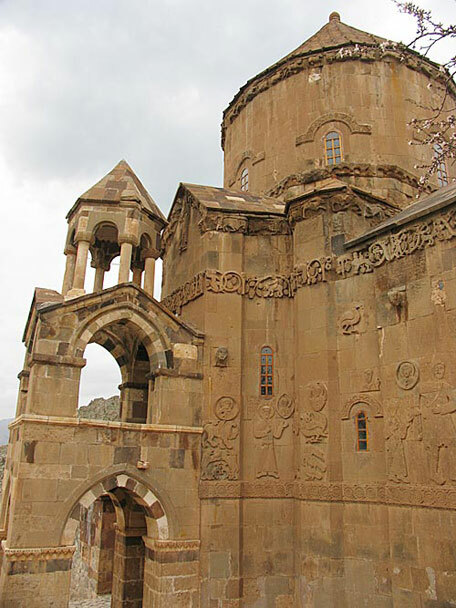 The church dates from the period of the Armenian king, Gagil I Artunsi, and was built in the standard Armenian style with a conical dome atop four axes. Our eyes are immediately drawn to the ornate relief work on the façade of the church; a veritable zoo of animals and birds ring the roof, door and wall iconographies. In the afternoon we set off on a drive along the ancient caravan route towards the spectacular sights of Mount Ararat. We stop at the Muradiye Waterfall and admire the landscape formed by the extinct volcano Tendürek Mountain (3542 metered high) before we reach our hotel at the foot of Mt.Ararat for two nights. The volcanic peak Mt.Ararat, (Ağrı Dağı in Turkish), stands at 16,700 feet, taller than any point in Europe. Its relative elevation over the surrounding plain is over 13,000 feet, making it one of the sheerest profiles in the world, comparable to Colombia’s Sierra da Santa Marta or New Guinea’s Mount Carstensz. The search for the remains of Noah’s Ark has been a passion for many, ever since the French nobleman Pitton de Tourne first scaled the mountain in 1707. The former astronaut James Irwing has initiated several efforts to prove that this is the site of the ark as written in the Bible. This morning we travel around the skirt of Mt.Ararat and drive up to the site of Noah’s Ark. It is optional to walk down the hill to the main body of Noah’s Ark. Today we drive to Kagızman and hire a local mini-bus to make our way to the village of Camuşlu where we drive uphill for half an hour, reaching the most impressive rock paintings from the Paleolithic period. Please be ready for a rough drive on a local tractor. Our journey next takes us via Kötek to Kars for lunch. 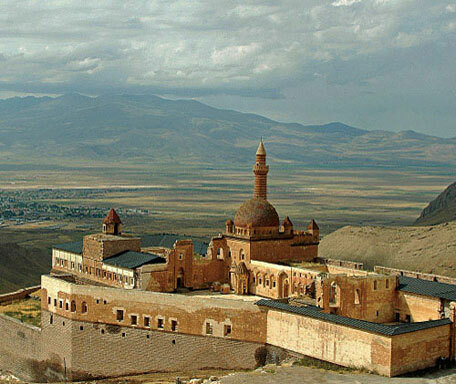 Kars served as capital to the Bagratid Dynasty during the early part of the 10th century. This is a city of contrasts and one is struck first by the grid layout of the city, so unlike other cities we have seen in Turkey. Then, we are surprised by the formerly graceful architecture of the downtown area that seems transposed from turn-of-the century Vienna or St. Petersburg. 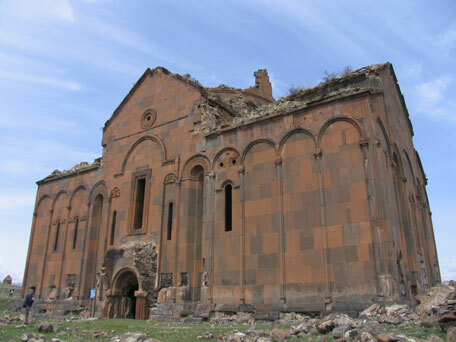 We visit Kars’s museum to see its small collection of archaeological finds from the surrounding area, notably from Ani. Also on display are impressive ethnographic articles such as clothes, household utensils, jewels, carpets and kilims. The city of Kars lies under the menacing shade of its citadel, a complex that seems to peer out across the plain from a harsh and stony hill. This was a fortress formidable enough to guard the most romantic frontier of imagination. After breakfast we are off to visit the skeleton of the medieval metropolis of Ani. Spanning across the endless meadows of the high plateau this is one of the most impressive sights of the Near East. This was a city of 100,000 inhabitants and the legendary 1,000 churches. The Gamsaragan Dynasty of Armenian lords held the city for several years, before the Bagratids acquired it in the 9th century. All guests enjoy our farewell dinner at a select local restaurant. This morning we explore the city visiting the Church of the Holy Apostles, Kümbet Kilisesi before we take our afternoon flight back to Istanbul. Guests are transferred to the Atatürk International airport to catch their flights home. The itinerary on this trip involves a good deal of walking and rough drives into the wild, allowing us to witness breathtaking natural scenery while visiting the unique historical wonders of Turkey. Good comfortable footwear is therefore essential. It should be pointed out that the tour may not be suitable for passengers who require assistance or who have difficulties with mobility. To fully enjoy this trip, please make sure you enjoy hiking, good local food, photography and cultural interaction. The average day temperature for this trip is around 25 degrees Celsius. Discretionary gratuities to specialist leader and driver.